Arbora is the new hilltop garden dining concept in Singapore recently launched on 12 October 2018 by One Faber Group. The restaurant name “Arbora” comes from the Latin word “Arbor” which literally means tree. The restaurant name is so apt as it is surrounded by Mount Faber Park which is one of Singapore’s earliest parks spanning over 40 hectares of verdant treetops filled with a variety of flora and fauna that is a perfect place to enjoy dining in a natural setting away from the city. Diners can look forward to enjoy an all-day dining menu with 35 selections that includes delectable starters, entrees and desserts created by Executive Chef Kenny Yeo. Our team would like to highlight some of the delectable dishes at Arbora. This is a delightful dish featuring assorted four varieties of forest mushrooms pan-fry to perfection with fresh garden salad leaves, cherry tomatoes and balsamico. The slow-braised beef cheek is so flavourful, we were told that the meat has been marinated for at least eight hours with port wine which will produce a sweet flavour and then braised with red and port wine before it was served. 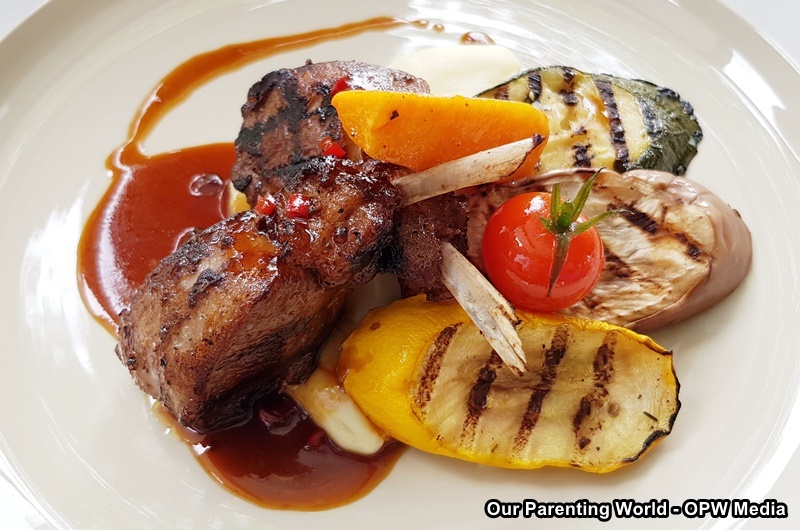 Using Australia-sourced lamb that gives an intense flavour, Chef Kenny further enhanced the flavour of the meat by using prune juice instead of mint jelly mixed with bell pepper and lemon to create a special sauce for the lamb chops. Chef told us that he used black prunes that are soaked overnight in red wine to give a sweet, sour and fruity flavour and then flattened the soaked prunes with a spoon to give a chunky finish. 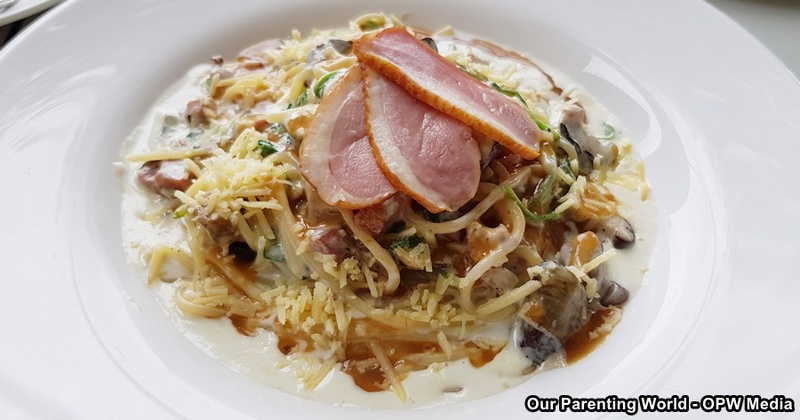 This dish is filled with savory, pan-seared smoked duck, fresh mushrooms and spinach, balanced perfectly with the smooth creamy sauce and spaghetti. Chef is a fan of duck meat and using the pan-searing method is his favourite style of cooking. This is a sumptuous stew that is filled with lobster, abalone, scallops and squid in tomato pronto gravy, served with crunchy garlic bread. To make this stew even more delicious, Chef added baby abalones that had been slow cooked to make them more tender and mussels from Australia, considered to be one of the best in the world. The stew has been simmered and cooked in rich tomato and shell fish stock that you will enjoy! 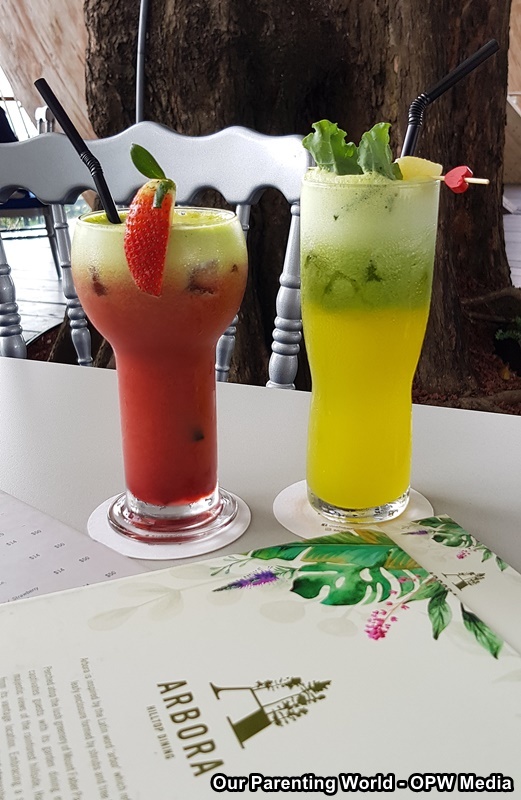 To complement your food, try out Arbora’s variety of refreshing drinks including made-to-order fresh-pressed juices that are available in three variations, Anti-Oxidant, Tropi-Kale and Sun-kissed Quencher all priced at S$12++ and made with locally sourced ingredients. Anti-Oxidant features beetroot’s multi-nutritional contents, complemented by a refreshing hint of orange zest to balance the earthy flavours. Tropi-Kale contains the superfood kale blended with a delicious mix of pineapple sweetness and green apple tartness. Sun-kissed Quencher is served with fresh-cut watermelon cubes that will give you a different mouthfeel to this refreshing, thirst-quenching fruit. To celebrate the opening of Arbora, the restaurant is offering a complimentary snack or salad to diners who order any two mains from the menu. On top of that, diners can also take this opportunity to try the signature Arbora craft beers at a promotional price of S$30++ for 3 bottles (U.P. S$36++).